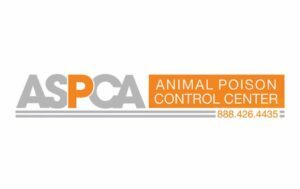 Charlotte Means, DVM, MLIS, DABVT, DABT, is Director of Toxicology at the ASPCA Animal Poison Control Center (APCC). She received her DVM and undergraduate degree from Oklahoma State University and a master’s degree in library and information science from University of Oklahoma. Dr. Means worked in small animal practice and as a clinical medical librarian before joining the ASPCA APCC. “Mom! The dog ate my art project!” This excuse is as old as homework itself, and fodder for sitcoms and comedians. But what about the pet? Should the pet be treated? Are clinical signs expected? The answer, of course, is, “It depends.” Whether the object is a kindergartner’s first homework assignment or the work of a professional artist, the toxicity depends on the media used. Art supplies can be divided into several different media categories (BOX 1). This article discusses the hazards of art media, not of tools used to produce art. How was the pet exposed? Was it by oral or dermal exposure, or by multiple routes? What were the brands and colors of the media? Is an Art and Creative Materials Institute (ACMI) seal present on the medium? An example of a typical exposure might be a dog that licked wet paint off of a canvas (oral exposure) and was standing in spilled paint thinner (dermal exposure) while licking the paint. The ACMI is an international association of more than 200 art, craft, and creative material manufacturers. It was founded in 1940 to certify children’s art material as nontoxic. The stated mission is to “promote safety in art and creative products through its certification program.” The ACMI has 2 seals: Approved Product (AP) and Cautionary Labeling (CL); examples can be seen at acmiart.org. The AP seal means the product is considered nontoxic for children and adults and does not contain hazardous material in quantities large enough to cause acute or chronic health problems when used per label directions. The AP seal replaces ACMI’s previous “AP non-toxic” and “no/HL” (no health labeling required) designations but has the same meaning.1 Clients frequently still have products with the older designations. Products must be labeled according to federal and state laws, but participation in the ACMI certification program is voluntary. To obtain an ACMI seal, each product is evaluated by a toxicologist at Duke University (BOX 2). Extensive testing is performed for acute and chronic toxicity. Complete formulas are reviewed, including every color of every product and every formulation change. Any new formulation must be certified to maintain the seal. Products are reviewed every 5 years to meet the requirements of the Labeling of Hazardous Art Materials Act, so it is recommended that each product be examined for the AP seal, even if the same brand was certified in the past. Store all surplus materials out of the pet’s reach. Do not feed or water pets in the area where art is created. Wash hands before petting animals, and do not use solvents to clean spills on animals. Do not leave pets alone in a room with open art supplies or recently finished artwork. The ACMI Approved Product (AP) seal means the product is considered nontoxic for children and adults and does not contain hazardous material in quantities large enough to cause acute or chronic health problems when used per label directions. Ingestion of modeling clay generally causes only mild gastrointestinal upset unless the amount ingested is very large. Large ingestions may result in a foreign body. However, glazes (typically mixtures of silica, fluxes, and colorants) for finishing or coloring clay may contain toxic components, such as heavy metals or solvents. Exposure to these glazes may be through the oral, inhalation, or dermal route. Clinical signs vary with the components in the glaze. If the ingredients are not known, do not induce emesis after glaze ingestion. If the glaze contains lead or cadmium, it should be labeled “Not for food use” or “For decoration only”; however, the label “food safe” does not mean the product is free of lead or cadmium, only that if applied and fired properly, the glaze should not leach lead or cadmium into food at concentrations above those allowed by the Food and Drug Administration. Ingestion of #2 pencils is commonly reported to poison control centers as soon as new school supplies are purchased. These are the ubiquitous pencils used by elementary school students and are typically required for tests. Pencils have a grading system based on hardness (H), blackness (B), and fineness. Most standard writing pencils are graded as HB. Pencils do not contain lead; rather, they contain graphite, which may cause mild stomach upset if ingested. Of more concern is the potential for a foreign body or perforation of the intestinal tract from a very sharp point. Most cases are treated by bulking the diet. Exposure to super glues (cyanoacrylates) generally causes only mild signs. Polymerization occurs rapidly, and systemic toxicity is not expected, regardless of the route of exposure (oral, dermal, or ocular). If the mouth or eyelids are glued shut, soften the area with tepid water; gauze soaked with mineral oil or ophthalmic ointment can also be used on eyelids. Eyelids generally separate in 1 to 4 days. Rarely, corneal ulceration may occur. Treatment of corneal ulcers should be symptomatic and supportive. Hardened glue in the skin or the mouth will wear off within a few days, and it is best to leave the glue in place. Glue that is attached to fur can be clipped off. Polyurethane glues, or expanding wood glues, which can cause foreign bodies that require surgery, are rarely used in artwork. Rubber cement and some epoxides are solvent based, containing ingredients such as acetone. Paint thinners and mineral spirits are petroleum distillate solvents. Xylene and other aromatic hydrocarbons may be found in products or used as cleaners. Most solvent exposures involve dermal and oral irritation. Small ingestions typically cause only mild gastrointestinal irritation, vomiting, and diarrhea. Vomiting can result in aspiration with subsequent pneumonia, although aspiration is not common. Large ingestions can cause ataxia, arrhythmias, tremors, and renal failure. Few animals willingly ingest large amounts of solvents. Dermal exposures can cause pain and erythema. Bathing with a liquid dishwashing detergent and administration of a mild short-acting opiate, such as butorphanol, typically resolve dermal signs. If the product is not removed, chemical burns are possible. Inhalation may occur, especially if the product contains heptane. Heptane is a very small molecule and thus can penetrate the alveoli more easily than can many other solvents. It can interfere with oxygen exchange in the lungs, and it may also induce chemical pneumonitis. This is most likely with inhalation, especially if ventilation is poor. Animals may become symptomatic within a few minutes to several hours after exposure to heptane. Signs include dyspnea, tachypnea, abdominal breathing, and wheezing. Radiographs generally show changes associated with noncardiogenic pulmonary edema. Treatment includes steroids, oxygen, and bronchodilators. If aspiration pneumonia is present, antibiotics are needed. Severe cases might require ventilator assistance. Heptane products are gradually being removed from the marketplace. Lead paint is one of the most problematic paints artists use. Other substances that may contain lead include glazes and pigments. 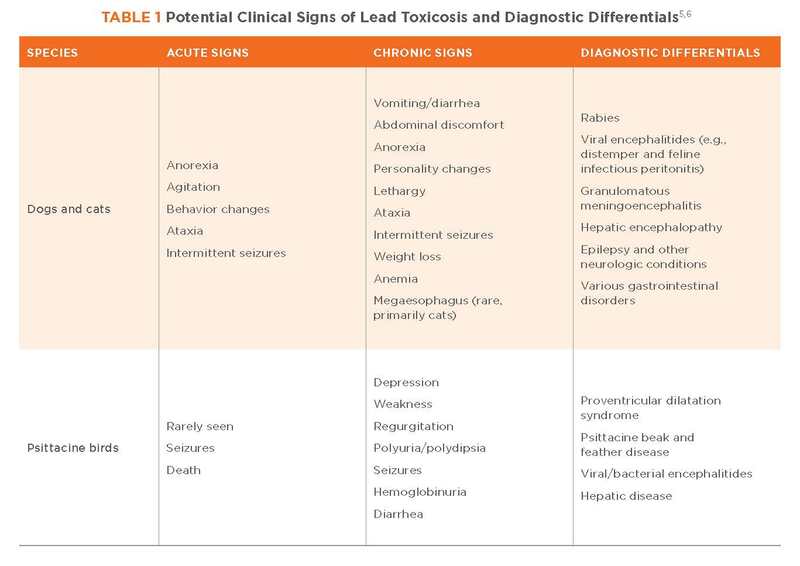 Lead exposure is most common in dogs, cats, and psittacine birds.2 Clinical signs of lead toxicosis and diagnostic differentials vary by species (TABLE 1). Toxic doses may be acute (e.g., 600 to 1000 mg/kg in dogs) or cumulative (e.g., 3 to 30 mg/kg per day in dogs). The form of lead makes a difference in toxicity. In dogs, lead acetate has a lethal dose low (LDlo) of 300 mg/kg, whereas lead oxide has an LDlo of 1400 mg/kg and lead sulfate has an LDlo of 2000 mg/kg. Different brands of paints contain different salt forms of lead at different concentrations.4 The LDlo is the lowest amount of a substance that causes death. Young animals absorb lead more readily than do adults.5 Onset of signs varies depending on the amount ingested, the salt form of lead ingested, and whether exposures were acute or chronic. Emesis is recommended for recent ingestions. Activated charcoal binds poorly to lead and is not recommended. Chelation is required in animals with neurologic or gastrointestinal signs; it is not recommended in asymptomatic animals. Over time, lead distributes to the bones and becomes inert. 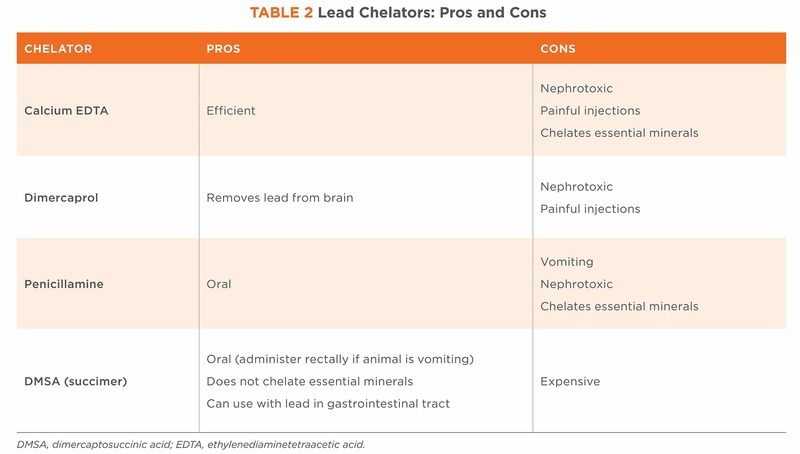 Chelators (such as calcium ethylenediaminetetraacetic acid) can pull lead out of bone, thereby increasing blood lead levels, increasing intestinal absorption of lead, and, in some symptomatic animals, causing worsening of clinical signs. 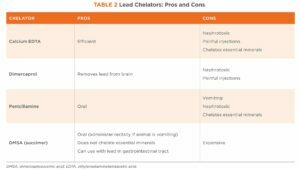 When chelation is required in animals with lead in the gastrointestinal tract, dimercaptosuccinic acid (succimer) is the only chelator recommended.6 Other chelators (TABLE 2) can be used in animals without lead in the gastrointestinal tract. 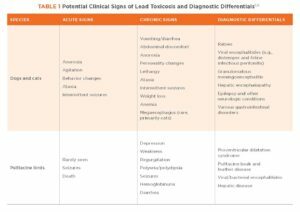 In many cases, the actual amount of lead ingested is minor and no significant clinical signs are expected. If chelation is needed, treatment should continue until clinical signs resolve and blood lead levels are reduced to background levels. The Art and Creative Materials Institute. acmiart.org. Accessed October 2016. ASPCA Animal Poison Control Center ANTOX® unpublished data. 2017. Stern L. How to be prepared for most toxic exposures in dogs and cats. Todays Vet Pract 2017;7(2):128-132. Abadin H, Llados F. Toxicological Profile for Lead. Washington, DC: Department of Health and Human Services; 1999:19-257. Gwaltney-Brant S. Lead. In: Plumlee KH, ed. Clinical Veterinary Toxicology. St. Louis, MO: Mosby; 2004:204-210. Wismer T. Lead. In: Peterson ME, Talcott PA, eds. Small Animal Toxicology. 3rd ed. St. Louis, MO: Elsevier; 2013:609-615.